Our tandem summer promotion is now reaching its final weeks. August 31st will be the last day that you will be able to jump for a staggering price of 166,99€! In Southern Spain we are lucky to enjoy a beautiful sunny summer with high temperatures. This is why we schedule all our jumps in the morning. Nothing beats a jump in a crispy and sunny morning where the horizon seems to never end. Seriously, get ready for some incredible scenery while you free fall at a speed of 120mph! Once your jump is completed, if you plan on sticking around the Seville area at least for a day, you will be able to enjoy one of the nearby beaches or visit Seville specially once the sun sets down. In case you didn´t know, Seville has been proclaimed as the top city destination in 2018 by the prestigious tourist guide Lonely Planet. Skydive Spain is part of the Swallow Group, a holding with three skydiving centers that has more than 25 years of experience in the industry. 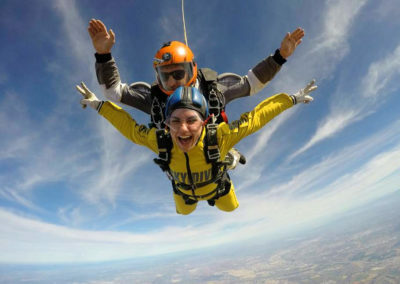 Skydive Algarve, is located near Portimao in the beautiful Southern Portuguese coastline of Algarve. The stunning views have made it be know as Skydiving in Paradise. Skydive Hibaldstow, located in North East Lincolnshire, England, host to the Open National Skydiving Championships for years. Among our instructors we have Skydiving World Champion, World Record Holders and instructors who live their jobs with passion and accumulate thousands of jumps of experience. You are definitely in good hands jumping with us. With this special promotion we really hope that most people who have ever dreamed with flying, will decide to make that dream come true this summer. Jumping from from 10,000 feet, with over 30 seconds of freefall and reaching a speed of 120 mph is something that everybody should try! Are you ready to fly? Booking is easier than ever. Just click on the Book Now button on the right top corner of our website and you will be taken to our online booking system, where in a mater of a few minutes you will be able to book the experience of a lifetime. Or if you have any other questions, feel free to contact us. We love to hear from you. Don´t forget, you must jump by August 31st to take adventage of our summer promo and jump for only 169,99€ at Skydive Spain!